If you’re not sure where to start? Call Budget Blinds and arrange a complimentary in-home consultation. You’ll learn about the newest styles and features, as well as get some guidance on colour choices and design. Find the right products to suit your home’s style and budget, in the comfort of your own home. 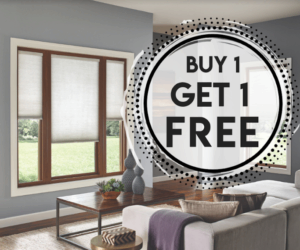 Call Budget Blinds today at 250.338.8564 or request a free in-home consultation online. Budget Blinds of the Central Island serves the Comox Valley, Campbell River, Nanaimo, the Cowichan Valley and beyond from their Courtenay showroom. Hurry – their “buy-one, get-one special” is valid for the month of January only!